Peace Plaza as it was. Peace Plaza is located near the world-renowned Mayo Clinic in the heart of downtown Rochester, an area that faces many challenges. 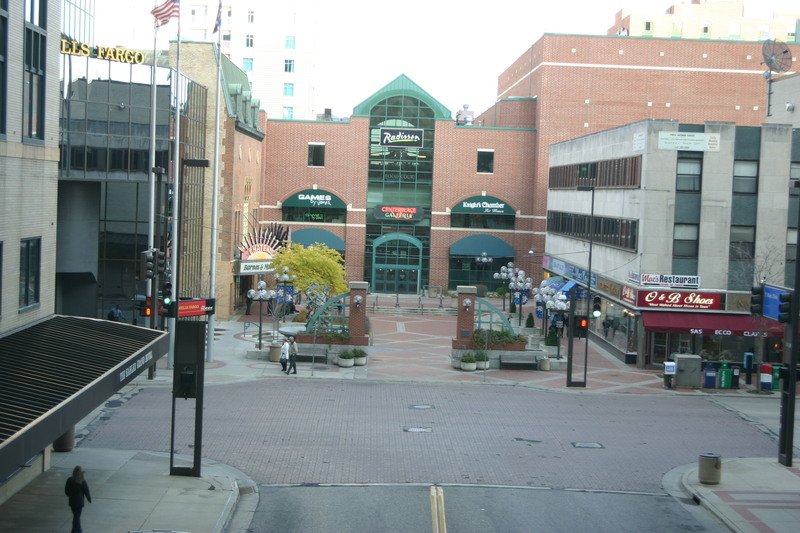 Downtown Rochester does not generate much public activity; blank walls on the ground floors of many buildings offer little of interest for pedestrians to look at or to draw people in, and there are few amenities that support the kind of lively street life that occurs in other cold-weather cities. Project for Public Spaces was originally asked for advice on what landscape architect would be sensitive to Rochester’s unique needs. After talking with us and learning about the added value of the Placemaking process, the city and the Downtown Alliance hired PPS to broaden the vision and garner more community input in the renewed Peace Plaza and First Street area. Peace Plaza and Annenberg Plaza are linked by First Street, which was envisioned as a possible “promenade” that could join the two plazas, as well as many other potentially great destinations downtown, functioning as the heart of a revitalized downtown district. PPS worked with the City of Rochester and the Rochester Downtown Alliance to improve the public spaces in and around Peace Plaza, the Mayo Clinic, and the hotels and retailers surrounding First Street. The goal was to create a cohesive gathering place for residents and employees of the downtown area, as well as the many patients and visitors of the Mayo Clinic. PPS facilitated two workshops with various stakeholders to develop strategies for bringing more activity and life to the area. Special consideration was given to a seasonal strategy, to ensure that the plaza is a destination year-round, even during the brutal Minnesota winters. The focus area has both skyways (above-ground covered walkways) and subways (below grade tunnels which house much retail), largely due to the seasonal variations. Develop a central gathering place along First Street, linking First Avenue, Peace Plaza and other downtown destinations. Start simple, allow for experimentations to determine what works best in the space, and then make changes and improvements as best seen fit. Develop a seasonal, all-weather programming strategy. The pedestrian should be king (or queen), calm traffic throughout the area. Prioritize street level retail, and emphasize a lively mix of downtown businesses, while minimizing the visual impact of medical and financial institutions. Lighten and brighten up the district; use color and lighting to provide a feeling of liveliness and activity along the street. There should be no blank walls in this area; use street exhibits, displays, lighting, murals and shopfronts to increase interest. Improve general orientation and street level signage. The City is now working with landscape architects Yaggy Colby and Associates and property owners to further the vision and begin construction on the area. Construction is expected to begin during summer 2006. 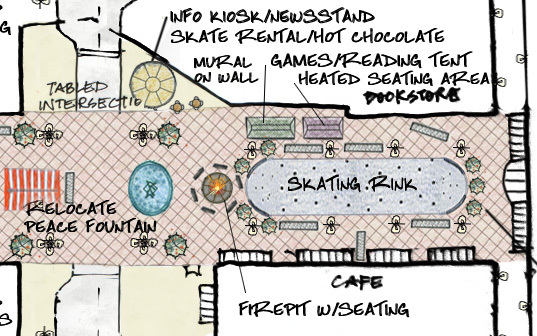 PPS’s report, A Vision for a New First Street Promenade and the Summer and Winter Programming Plans, are available on the City of Rochester’s website. Detail of PPS's Winter Programming for Peace Plaza and the First Street Promenade.